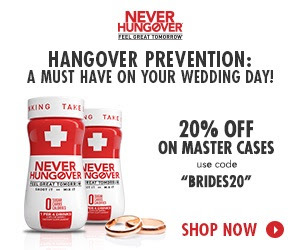 Never Hungover is a groundbreaking hangover prevention drink that you take before or while drinking. With wedding season approaching fast, it is a perfect addition! Guests will definitely thank you for helping them prevent a bad hangover the day after and you also deserve to enjoy your party without a headache the next day!
. This offer can not be combined with other codes.